Explore the influence of sound on the brain as well as simple ways to use sound to enhance relaxation, emotional balance and mental focus with breath-work and an open sonic meditation. Music is a part of the human experience both in ceremony and celebration, common to all cultures throughout the world. This 2-hour workshop explores the influence of sound on the human brain; and simple ways to use sound to enhance relaxation, emotional balance, and mental focus. 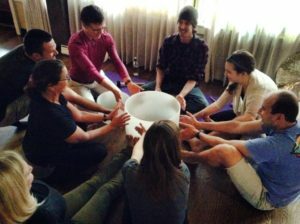 The workshop includes breath-work and other techniques and concludes with an open sonic meditation.